Trends in Sales & Operations Planning - E2open | Demand. Supply. Delivered. 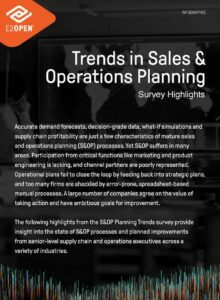 Gain insight into the state of sales and operations planning (S&OP) processes and the ambitious goals shared by numerous companies. This infographic gives you the big picture from senior-level supply chain and operations executives across a variety of industries.